Whether you have been sewing for a while, or you’re just starting out, you’re bound to run into questions during your sewing projects. Common questions involve the use of fabric glue. These questions may range from when should you use fabric glue instead of sewing, how do you use fabric glue, what is fabric glue used for, and so on. The following should help answer as many of these questions about fabric glue vs. sewing as possible. The short answer is yes. However, it depends on what you’re using it for. Fabric glue works best with certain fabrics and certain things such as adding embellishments like sequins or gemstones. For example glue wouldn’t work for making an article of clothing, but it would work in smaller parts of that clothing like in adding an appliqué. What is fabric glue used for? 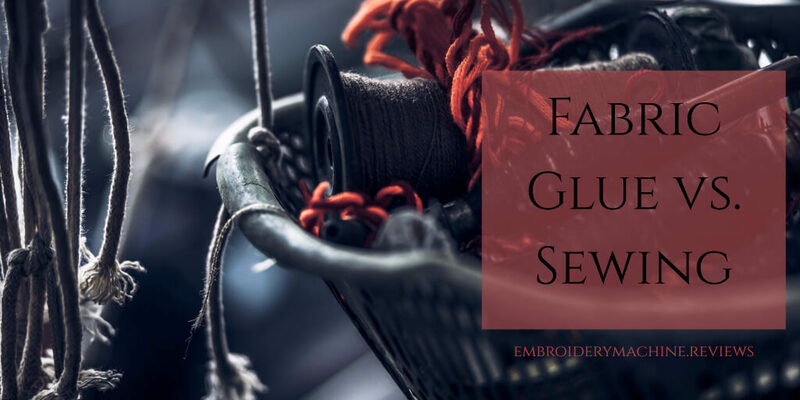 Fabric glue can be used for many different things during sewing projects. It is mainly used for temporary purposes or adding embellishments. It can also be used to help make projects with kids easier. While you wouldn’t use glue for making garments like tops that need to be made to last, you can use it to make other things like accessories as in bags, or even things like shoes or jewelry. It is also a must in certain areas where sewing isn’t an option. An example of this is if you are working with a thick material such as leather. How do you use fabric glue? Depending on what you’re using it for, or what kind of glue you’re using, all fabric glues work basically the same. As per this tutorial on YouTube, you always want to use a thin, even layer over the back of the fabric. You want to press the material with an iron or fabric press to set the glue. Repeat as you need. The tutorial shows a great demonstration with different materials and has plenty of useful tips throughout the video. Short answer: Yes but it depends. This is actually a bit of a tricky one to answer. Some glues will wash off materials, others not as well. All fabric glues will hold up well in the wash, but not for long. Each use will weaken the glue, so be careful when washing. Don’t use glue on items you want to last a long time. Can I use fabric glue instead of sewing? As stated previously, yes. But it all depends on what you’re using the glue for, and how long you want the item to last. Fabric glue really is best when used for temporary things and for items that are hard to sew. It is not recommended for things that would normally require a lot of sewing, or things that are being made to last. If you don’t plan on washing the item you are gluing then it will last much longer. Something like a Halloween costume would be fine for fabric glue since this is an item you wouldn’t use for every day wear. Where can I get fabric glue? Fabric glue should be pretty easy to find, depending on the type you are looking for. You can find it at any craft story such a Michael’s, or anywhere you buy sewing supplies like Joann Fabrics. Chain stores such as Wal-Mart or Target may also carry fabric glue, but options may be limited at these places. Basically, if you can find fabric at a store, then you should be able to find fabric glue there. What is permanent fabric glue? Is it any different than regular fabric glue? When it comes down to it, not really. It may be stronger and it may last longer. All fabric glues will basically be the same. Some might last longer than others. Some glues may wash out easier than other glues. There is also a superb blog page which is incredibly informative; it goes into great detail on all the different types of glue and their purposes. It all depends on your purpose for the glue and how strong you need it, and how long you need it to last. Check out Dream a Little Bigger – it has all the glue information you could ever imagine needing for any type of project. How do you get fabric glue out of clothes? This may be one of the most common questions asked about fabric glue. This is because glue is messy and it can easily mess something up when you accidentally get it on something you didn’t want it on. There is a how-to page on How Stuff Works which does pretty well to answer step-by-step on how to remove unwanted glue from clothing and other things. Fabric glue can be a fun tool in your sewing tool kit. It can also be a little tricky working with it when you’re inexperienced with it. Follow these tips and there shouldn’t be any problems.